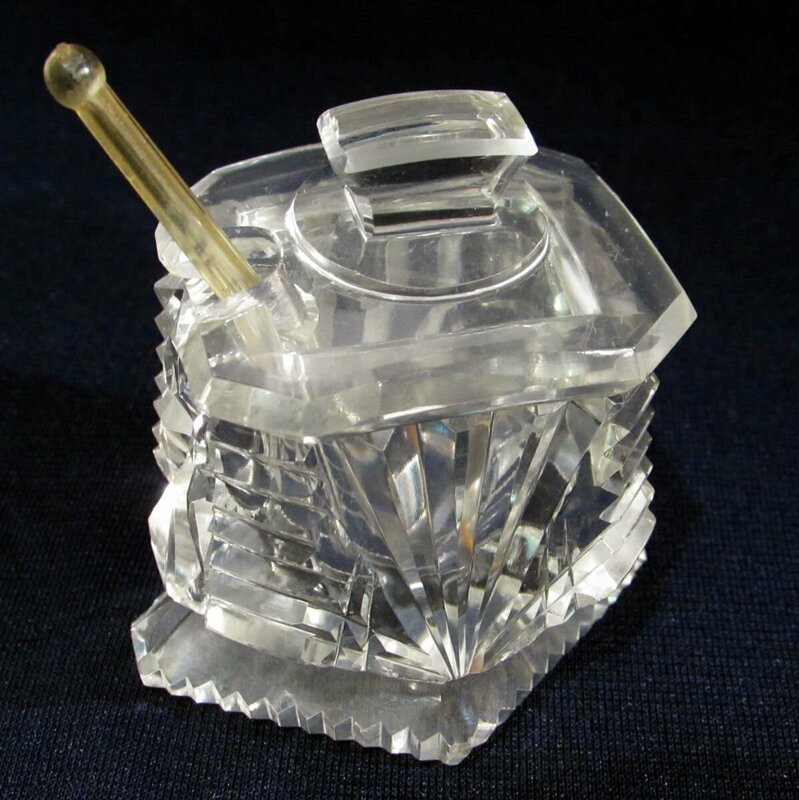 Offered is an antique cut glass footed mustard with lid and spoon. This is a "footed" mustard. The base is in a diamond shape. The cut on the mustard is very nice. The lid fits perfectly. The spoon, I believe, is original. It is a plastic spoon. Mustard measures 2 1/2 inches high to top of lid and 2 1/2 inches long. In very good condition. There is a small flake that is near the base just above the foot. The way it is done makes me believe it was done in the making as there is no damage to the foot. There are a few "expected" small nicks to some edges. A very nice piece. Comes from a smoke-free environment. Your satisfaction is my goal and it is never my intention to misrepresent an item. If you are not completely satisfied, please contact me before leaving negative feedback. I provide great customer service and I will work with you to resolve any issues. If purchasing more than one item, I am happy to combine into one package. Please wait for a combined invoice with revised calculated postage. There are no additional handling fees. Pennsylvania residents please add six percent (6%) sales tax or provide a tax resale number. International Buyers: I am happy to ship internationally. Please remember that shipping via First Class International may take four to eight weeks to arrive. Import duties, taxes and charges are not included in the item price or shipping charges. These charges are the buyer's responsibility. Custom clearance may delay receipt of your item. Vintage Signed Lisner Pearl and AB Rhinestone Gold Tone Choker Necklace 17 1/2"